The spring of the year is full of so many activities, ranging from sports, pageants and theater productions, tryouts, testing, mad rush through the curriculum and of course IEPs and Transition plans! And that doesn't even start to touch on the budget issues, personnel issues and graduation! So much to do and so little time to do it. What is important? What takes a second seat? What doesn't even make it on the bus? We make decisions every day on what is the most important and what goes on down that line of priorities! So often the deciding factor is the proverbial "squeaky wheel!" I hope you have a morning rubric you follow to help you make these decisions. If not, maybe now would be a good time to create/borrow/steal/modify one and consider using. I have one but I have to admit I am not faithful in using it — but if I didn't have it, I would never use it, right? Mine is a simple 4 block square. Top right: Immediate — Due NOW; Bottom Right: Now — Due Today; Bottom Left: Tomorrow — Due This Week; Top Left: Soon — Ideas! Of course, this looks like I only think about one week at a time, right? But I have another chart for the rest of the year! I have been using that one from about my first year of teaching when I was teaching Senior English at Glynn Academy High School in Brunswick, Georgia, in 1972 and needed to assure both my students and myself we would not be doing grammar all year! I use it at home, at church, as well as at work ... it helps me see in one glance the big issues/due dates for the whole year — all on one page! My mother used to laugh at the one on the refrigerator at home as I color-coded it based on the family member. Yes, we are all a little obsessive sometimes! The bottom line, if we have no way of helping us see what is important we may make decisions based on what others think is important. Just a thought for this Monday morning mid-April! Speaking of a "thought"... Congratulation to Dr. Adam Leckie for successfully defending his Doctorate at Arizona State University! We need to celebrate the wins of our colleagues whenever possible! Did you know Adam was our 2nd recipient of the G Award several years ago? I bet you know someone who is in their first 5 years of administration who is deserving of this great award! Why not nominate them for this great recognition! The CASE Early Career Special Education Administrator Award will be presented to a Special Education Administrator who is a member of CASE and in their first five years administering special education programs and/or services, and who embraces 5 of the pre-selected values of the 17 Gersh Values. The nomination should be sent to CASE Membership chair, Dr. Julie Bost (NC) at 40 Windrift Court, Gibsonville, North Carolina, 27249 336-847-0749 by June 30! Information can be found on the CASE website or download the form above! I did get several nomination forms for committees last week but was hoping for even more! Being on a CASE committee is a great way to get more familiar with CASE and there are all kinds of benefits to your state/provincial unit when you are on a committee. Sound interesting? Why not complete the Committee Member Nomination form and send back to me and you might be selected to be on one of our committees! Committee membership is a great leadership development step, too. I would say most of our committee chairs served on a committee prior to being selected as a chair! So, fill out this form now and send back to me. It is NOT too early to be registering for the CASE-CEC Special Education Legislative Summit... CASE has been doing a legislative summit for 16 years! For the last 3 years we have partnered with CEC to increase our footprint up on the Hill! All the information you need to make an informed decision is right at your finger tips at the SELS website. I strongly encourage you to add the bus transportation to your registration as the D.C. Metro seems to always be under construction right now — the bus into the D.C. for that Tuesday is the least stressful way to go! I always encourage folks to take advantage of the great location and hotel rate and bring your family/friends — come in early or stay late and do some sightseeing. There is always something new to see in D.C.! But most importantly, we want to have special education administrators from EVERY state represented in our SELS. Last year we had over 250 people from 44 different states up on the Hill advocating for students with disabilities! We need you! Check out the information and add this to your professional learning budget! I think there are several lessons to be learned from the answers of this question. One big one is the importance we as leaders play in the development of other leaders! Thirty percent of those answering the polls said they started up the admin career ladder because someone at the district level approach them! We need to remember that and find those potential leaders and encourage them! Another lesson is another 30 percent got into administration to have a bigger impact! What a noble reason and one I hope we still have our sites on even today! Remember, by being involved in your state/provincial CASE unit and CASE, you can have an even bigger impact! 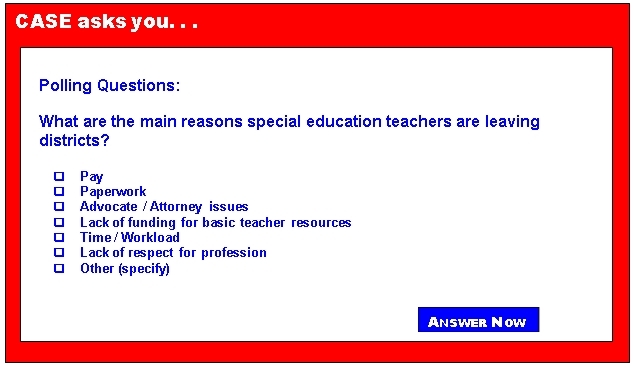 And one more take away from this poll, not one person said they got into special education admin because it paid more than teaching. We don't do it for the money ... remember that during the stressful spring days ahead! Hope you have a wonderful week, full of opportunities to pick the important things to do to make a huge impact on your students, staff, parents and community! Students spend a significant amount of time in school, and as a result, students’ feelings about their school experience can have a big impact on their daily lives. School climate has been described as the overall “feel” of the school. Students not only need to feel safe at school, but should also feel as if they are part of a supportive environment. Persistent positive school climate has been linked to positive student development, learning, academic achievement, effective risk prevention and health promotion, high graduation rates, low dropout rates, and teacher retention (Thapa, Cohen, Guffey, & Higgins-D’Alessandro, 2013). A positive school climate should be a priority because learning in a safe, engaged, and responsive environment sets the foundation for positive academic, social, and emotional development (Blum, McNeely, & Rinehart, 2002). Thus, over the past few decades, school climate has gained recognition as a crucial step in K-12 school improvement processes. Tell Congress to protect funding for the Javits Gifted Education Program!